This is one of my middle daughter's favorite Meatless Monday soup recipe ideas. She isn't a meat lover--so traditional chili recipes often miss the mark for her. 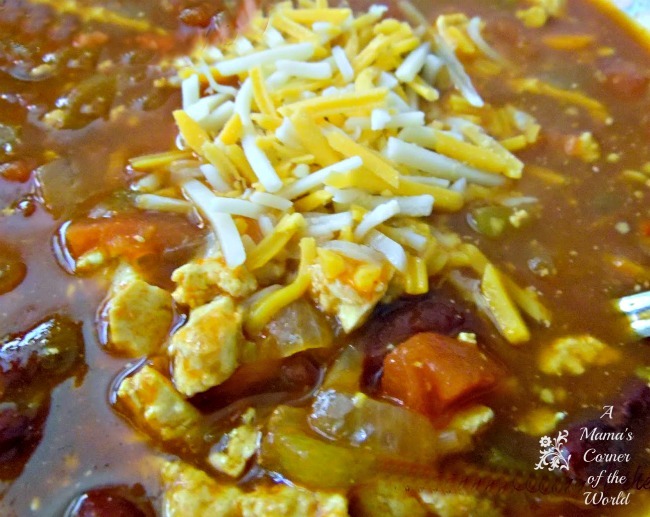 This recipe combines a lot of her favorite chili flavors in a meatless, slightly thinner soup. We often serve leftovers of this recipe over spaghetti to change it up a little too! Prepare the Cooked Vegetables. In a stock pot or dutch oven, heat the olive oil. Add the onions, carrots, celery, and the crumbled tofu. Cook over medium high heat until the vegetables are tender and the remaining water evaporates from the tofu. Season the Vegetables. Add the Garlic, Chilli Powder, Cumin, Salt and Pepper to the vegetable mixture. Continue to saute for an additional 2-3 minutes--stirring frequently to prevent sticking. Add the remaining Veggie Taco Soup ingredients. Directly to the cooked vegetable mixture, add the salsa, green chilies, tomatoes, beans, water and vegetable broth. Stir to combine. Simmer, Garnish and Serve. Bring to boil, reduce heat and simmer over low heat with lid slightly vented for 30-45 minutes. Ladle into soup bowls and sprinkle with shredded cheese and a bit of sour cream, if desired. Serve warm. I usually skip the added salt if using canned or jarred add-ins since they are generally, already sodium loaded. I often serve the taco soup over a portion of cooked, warm pasta or even steamed rice instead of serving as a soup. This is especially good for second day leftovers. If the tomatoes or salsa are a bit sour to taste in the soup--add Stevia or sugar to taste to balance the flavors.